Last edited by Nukalpiaq; 08-01-2009 at 23:46. Those are some beautiful fish. I am doing a float on the Kanektok in July, and am hoping to find some of those beauties. Nice looking fish! Thanks for Posting! Looks like a mouse pattern, how exciting was it to see it strike the surface? Is this a leopard rainbow and for that matter what the heck is the difference? Is it just the pattern or are they a strain all by them selves? 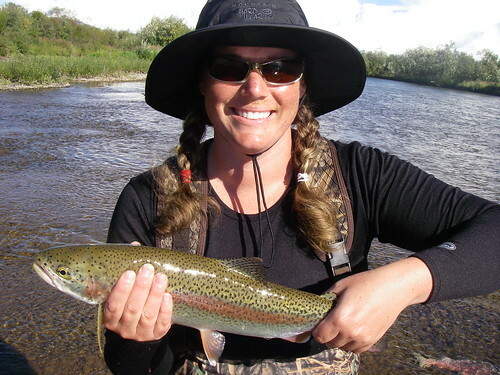 Here is a description I found online of what an "Alaskan leopard" rainbow trout is: Alaskan leopards are characterized by having large beautiful red to pinkish longitudinal bands down their sides and an above average number of large black spots compared to other Rainbows. This strain of Rainbow trout is notorious for having brightly colored gill covers as well as strong genes that help them live long, and grow big in Alaska's colder waters. If you haven't moused for leopards, man you are missing out on the greatest thrill you can have as an angler fishing top water. Sometimes these bows are so explosive when they take the mouse pattern off the surface that they just hook themselves, this all happens while you are watching the show just awed by the take. A split second later you catch yourself and realize this is not solely a spectator sport, so you do your part and act like you are setting the hook but really you are just double checking to make sure it is set. You do this so that your fishing buddies dont rib ya later about the fish catching itself on the end of your line. The two loudest sounds known to man: a gun that goes bang when it is supposed to go click and a gun that goes click when it is supposed to go bang. Wow. Little bit sporty on that 5-weight too, I bet! Last edited by alaskachuck; 04-16-2009 at 19:17. Nice leopard pics everyone, here are a few more Arolik River leopards that me and my fishing buddies caught and released. Noticed that these bigger fish on the Arolik have this golden hue to them, on the Kanektok I see that a lot of bows are chrome leopards. Anyone ever see these type of differences anywhere else? Last edited by Nukalpiaq; 08-01-2009 at 23:45. 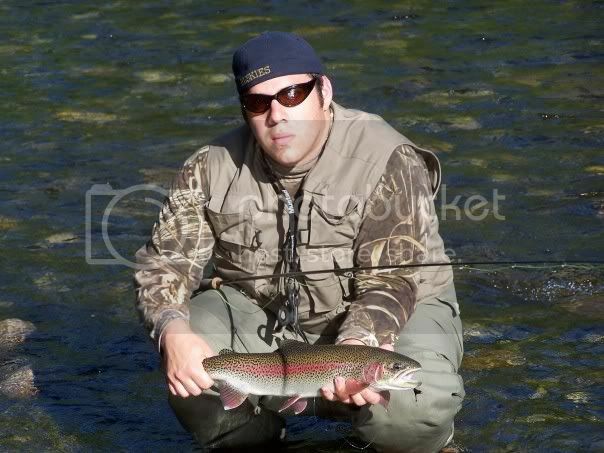 That is a sweet camera angle AKPM on the trout and your real. Nice shot. Think I will make it my new wallpaper on the 'puter. thats just speculation on my part.. Many of the systems that have "leopard" bows have no major lake associated with them and dark substrates and as such have darker, spotted fish. In systems like the naknek and kvichak, fish will go dime bright in the lake and then darken and spot when they come into the rivers for any extended amount of time. Leopard bows haven't been shown to be genetically distinct from fish of other patterns, it's more of a fisherman derived distinction...but they are nonetheless pretty. I draw the line with the spottedness if they have spots in their eyes....that's just freaky. Now that is an interesting hypothesis on why Alaskan leopards are spotted and vary in coloration, thanks a lot. Decided to post a photo of my son and I "enjoying the moment" on the Arolik river together. He has been my constant fishing buddy ever since he was able to hold a fishing rod in his hand. Catches a few bows now and then too. Last edited by Nukalpiaq; 01-23-2009 at 22:34.